When I was a little girl I loved little simple dimestore toys like yo-yos. 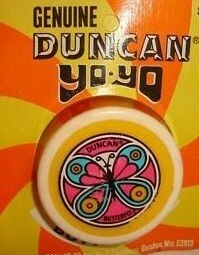 During my childhood years, yo-yos were usually manufactured by Duncan. They often appeared as small birthday gifts from neighborhood friends, or as a party game prize. My favorite was the glow in the dark yo-yo, like the one pictured here. June 6 is National Yo-Yo Day. Who knew?! I didn't, but that is a fun holiday. In 1928, Pedro Flores, a businessman who immigrated to the U.S. from the Philippines, started the Yo-yo Manufacturing Company in Santa Barbara, California. In 1929 this company was purchased by Donald Duncan. In 1946 the Duncan Toys Company opened their first yo-yo factory in Luck, Wisconsin. In the 1950's Duncan created a light-up yo-yo. There is a World Yo-Yo Contest held annually in Orlando, Florida. Contestants do compulsory tricks and also perform freestyle with a yo-yo. 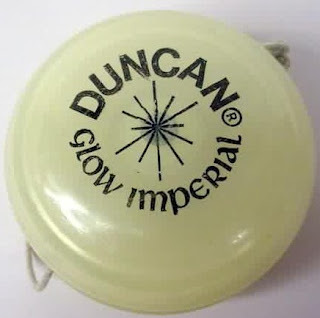 Duncan yo-yos are still made and come in many different models, like the Imperial, the Butterfly (I remember this from childhood), the BumbleBee, the Dragonfly, and more. Some of the different yo-yos are better for tricks than others. Popular yo-yo tricks include Walk the Dog, Around the Corner, and The Sleeper. In 1968, Abbie Hoffman "walked the dog" with a yo-yo while testifying before a Congressional committee. He was found in contempt. 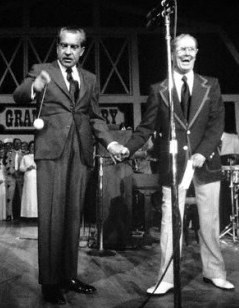 Richard Nixon played with a yo-yo at the Grand Ole Opry shortly before leaving office in 1974. Roy Acuff taught him to play with the yo-yo onstage. A yo-yo traveled on the Space Shuttle Discovery in 1985. How about you? Did you play with yo-yos as a child? Can you do any yo-yo tricks? I'd love to hear your memories in the comments, below. Oh I used to love this toy! I want to go out and buy one now. My summer camp had a yoyo guy come every summer and I was obsessed! I love finding out about the history of stuff that you just accept in life. A yo yo seems so simple but it has a life and a past! Thanks for sharing. This is really cool, Trish! I had no idea yo-yos had a special day! I used to play with them all the time when I was younger - so fun. I love how you included old photos and even that video clip! I used to yo-yo when I was a little girl and I remember loving it! I had fun watching the commercial for the yo-yo haha! Thanks for visiting! I enjoyed reading your yo-yo memories too.